While weddings are great, this is the fun part. Imagine, just the two of you, intrepid explorers, out to conquer New Zealand one island at a time. Visit a live volcano, soak in a hot stream, toast your new life in an award-winning vineyard, paddle along golden sand beaches, heli-hike on a glacier, and take the plunge (again) in Queenstown. The list of things to see and do is longer than your gift registry (wait, is it too late to include this trip?!). The adventure capital of the world is surely the best place to kick off the biggest adventure of them all. 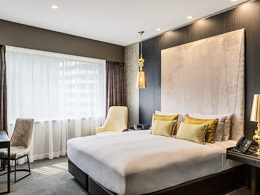 A stylish hotel based on Auckland’s vibrant Viaduct Harbour. 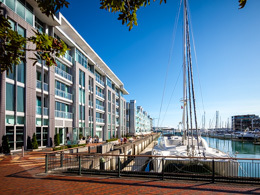 Juliet balconies with views over the marina, rain showers and deep bathtubs offer the chance to rejuvenate in luxury, with the City of Sails at your doorstep. Welcome to New Zealand! 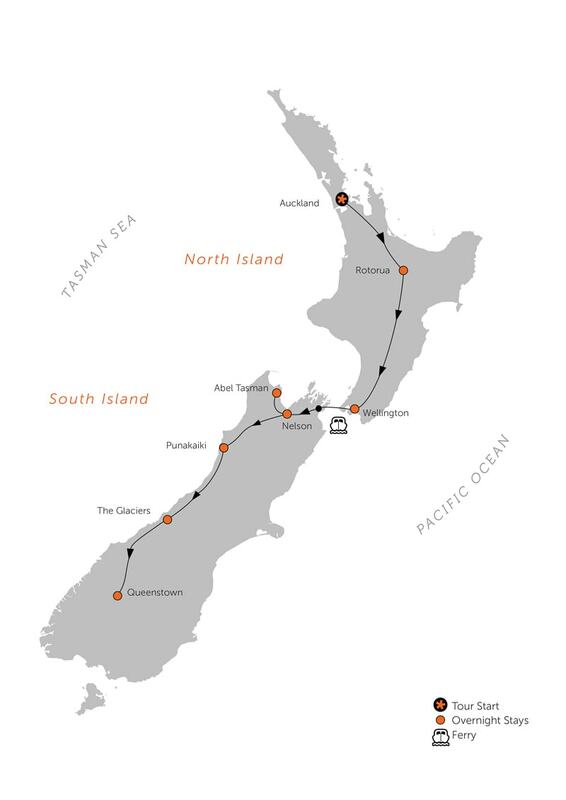 You will be transferred to your central city accommodation, where a Black Sheep team member will meet you to discuss your trip and driving in New Zealand. The remainder of the day is free to recover from your journey and to explore this vibrant waterfront city. 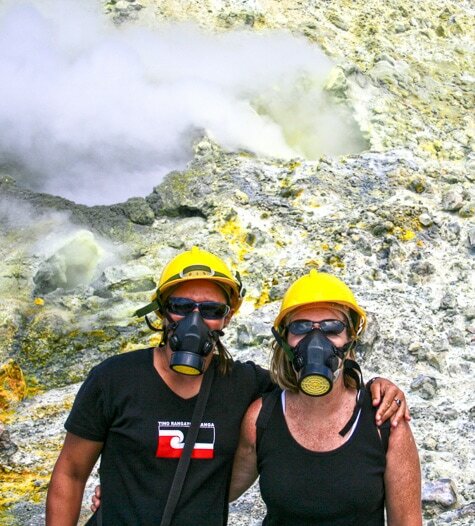 Head south to Rotorua, a centre for Maori culture, geothermal activity and outdoor adventure. Included today is a hilarious OGO ride. 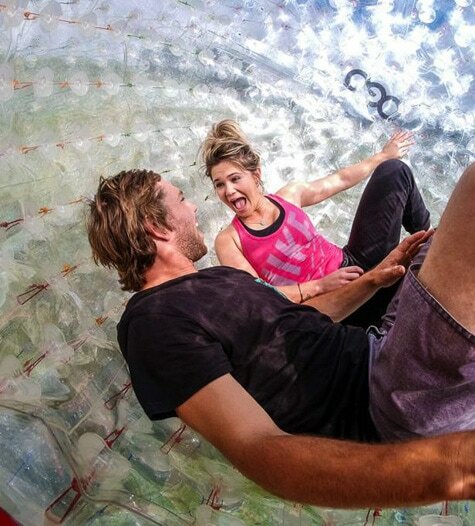 Slip, slide and laugh your way down hill tracks inside a giant inflatable ball. Additional, optional activities include a visit to Hobbiton, mountain biking on some of the country’s best tracks, and more. 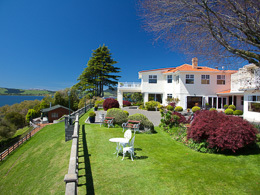 Today you have an included visit to Rotorua’s lakefront spa. Soak in thermal pools overlooking the lake before a signature mud wrap treatment packed full of minerals sourced from this volcanic region. Optional activities can be arranged around your spa visit. 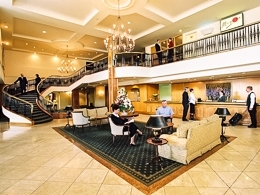 Request a detailed itinerary for suggestions. Ferry across the Cook Strait and into the Marlborough Sounds, gateway to the South Island. From Picton, travel to the Marlborough wine region, renowned for its Sauvignon Blancs and Chardonnays. Consider stopping for tastings and a winery lunch amongst the vines before carrying on to sunny Nelson, stopping for a river walk or swim along the way. 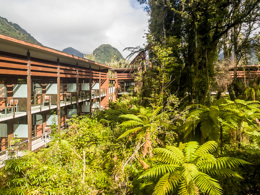 A unique eco lodge in the heart of the Abel Tasman National Park, accessible only by foot, air or sea. This warm, inviting lodge is nestled amongst native forest and is a short stroll from stunning beaches and waterways teeming with aquatic- and native birdlife. Travel by car then by water taxi to a remote lodge in the heart of the Abel Tasman National Park. The lodge’s stunning, environmentally sensitive architecture is a blend of modern and rustic. Nestled amongst native bush and framed by forested mountains and golden beaches, this glorious setting is your base for the next two nights. The Abel Tasman, with its temperate forest, aquamarine water, and golden sand beaches, is one of the country’s most beautiful parks. 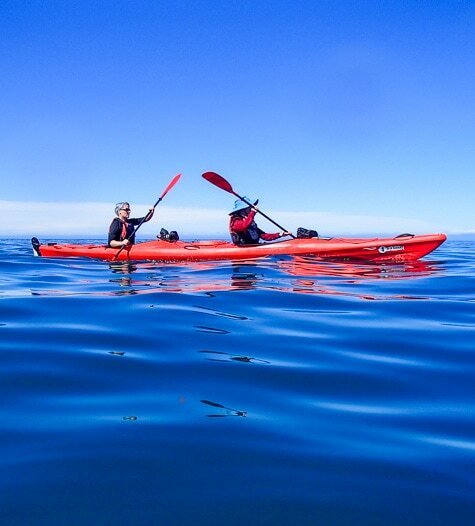 You have the full day to enjoy the lodge’s setting and activities, including sea kayaking, swimming, and walks along the Abel Tasman track, one of New Zealand’s Great Walks. Your water taxi delivers you back to base to collect your car and resume your journey to the West Coast via the Nelson Lakes region. 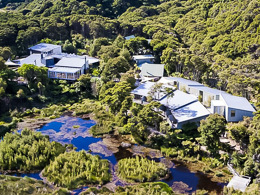 You’ll have to discipline yourself to keep your eyes on the road and your hands on the wheel as you wind through the beautiful Buller Gorge and along dramatic coastline to the Pancake Rocks for your two-night stay. 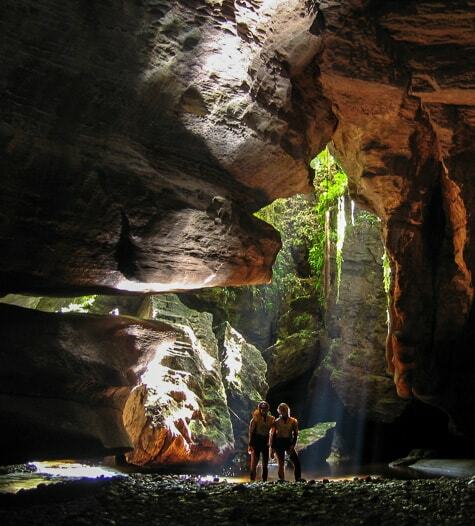 Today, you’re off on a memorable cave rafting adventure. Armed with wetsuit and hardhat, explore a natural cave system on your way to an underground river. Board an inner tube and drift beneath an amazing constellation of glowworms. Exit the cave and ride over gentle rapids back to the start. Plenty of laughs are had on this unique adventure. Dense rainforest lines the way as you drive south to New Zealand’s Glacier Country. 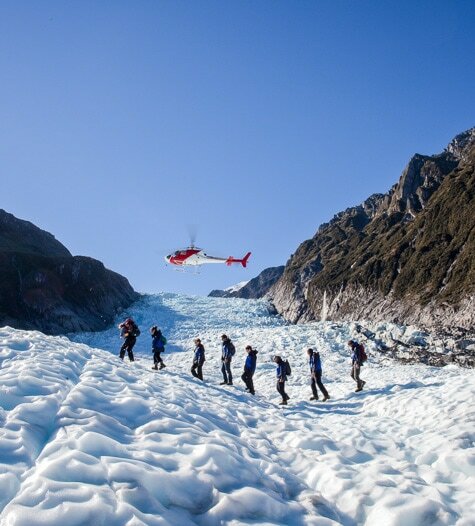 Arrive in the alpine village of Franz Josef and board a helicopter for a flight over Franz Josef’s blue-ice crevasses, landing on its neve for spectacular views of the surrounding peaks and the valley below. Wake up early to catch the reflections of Lake Matheson at their best before heading to Queenstown via the stunning Mt Aspiring National Park. Your trip notes suggest beach, forest, river, and waterfall walks on route, capturing some of the region’s most photographic views. Pause in lakeside Wanaka before heading over the Crown Range to Queenstown. 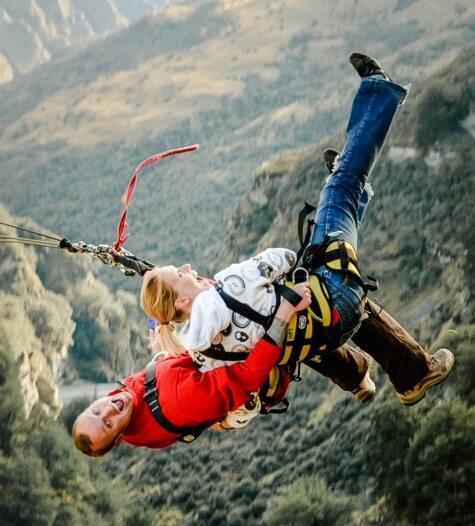 Today you have the opportunity to experience some of the best activities Queenstown has to offer. 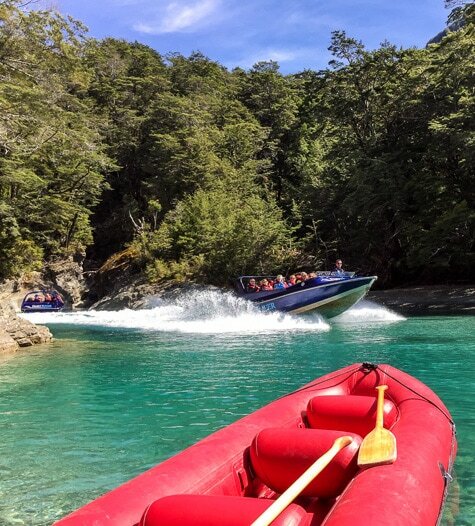 Choose from a combination of a Shotover Jet jetboat ride and a lovers’ leap off the world-famous Kawarau bungy bridge, or alternatively, travel to Glenorchy for a very special jetboat and canoe safari deep in the heart of the Mt Aspiring National Park. There are so many things to do in this adrenalin capital that we’ve left today free to pick and choose how you wish to spend it. 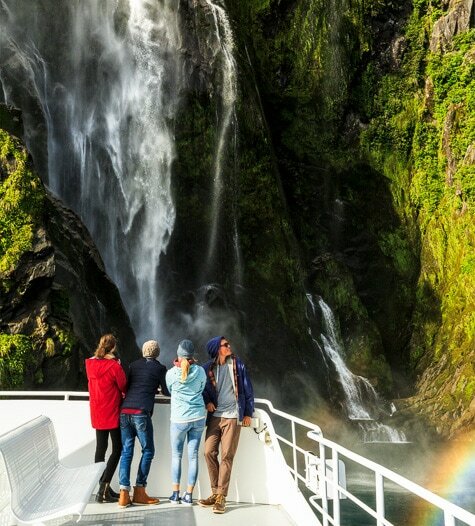 Optional activities include the all-out variety, like whitewater rafting, skydiving, and canyon swinging; or more benign pursuits like cycling, wine trails, or an excursion to spectacular Milford Sound. Your Travel Shepherd can help with the dizzying array of options. 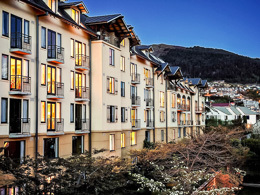 Depending on your departure flight, have a leisurely lakeside breakfast or squeeze in one last adventure before you drop your rental car off at Queenstown Airport and await your flight home, ready to embark on your greatest adventure of all—your new life together. Bungy jumping has nothing on that one. 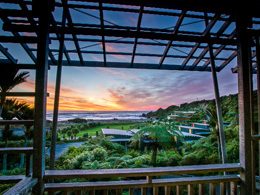 THE NEW ZEALAND TRIP ORGANIZED BY YOUR TEAM WAS THE BEST HONEYMOON FOR US. NONE HAVE MANAGED A TO Z SO PROFESSIONALLY.